THE INTERNATIONALE draws on people's stories of an emotionally charged radical song (the long-time anthem of socialism and communism) to celebrate the relationship between music and social change, and to evaluate the uncertain fate of once thriving movements of the left. The film chronicles the history of the song written in 1871, at the fall of the Paris Commune, by Eugene Pottier. The lyrics are a rallying cry for all the oppressed and exploited people of the world to rise up and overthrow their masters. After a melody was added a few years later by a French factory worker, Pierre Degeyter, The Internationale spread throughout France, Europe and the world. Using rare archival footage, the film traces the development and meanings of the song before and after the Russian Revolution, during the Great Depression in the U.S. and the Civil War in Spain, and since the fall of the Soviet Union, Tiananmen Square, and the end of the Cold War. The film includes performances and interviews with musicians and activists from around the world, including Billy Bragg and Pete Seeger, and people from the U.S., Israel, the Philippines, China, and the Soviet Union. Exploring relationships between music, history and social change, THE INTERNATIONALE is a serious but often irreverent meditation on socialism, idealism, and the power of music in people's lives. Hilarious 7 minute animated introduction to Karl Marx's worldview. Traces the history of Ireland through her music, and Ireland's music through her history. 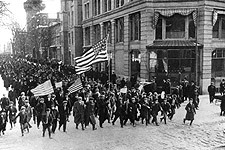 The story of the young, Jewish, Ukrainian-born woman who in 1909 sparked the 'Uprising of the 20,000' -- the first massive strike of New York City garment workers.